Your home is your retreat away from the world where you spend time with your family and loved ones. However, when a foul odor arises, you no longer want to spend time there and deal with the smell. For San Diego residents, this can be extremely irritating. While sometimes an odor is something small, like needing to take out the trash, it can also be something much more serious. What could be causing that smell? See if it’s any of the following, and do what you can to remove the smell yourself. If you can’t, be sure to call the sanitation services experts at SM Absolute! If you live in a spacious home, there may be a guest bathroom that doesn’t get used very often. When these bathrooms are neglected, they can sometimes develop a methane-sulfur smell that comes from the drains in the tub or the sink. All pipes lead to the sewers, but they are designed to use suction in order to keep the smells from the sewer from getting into your drains. However, in order for them to work to their fullest, they need to have some water first! Once all this water evaporates, the gasses build and are often released into the bathroom. To prevent this from happening in the future, turn on the water once a week in both the shower and the sink. Believe it or not, many plumbing systems vent through the roof of the home. Depending on which way your home faces, the sewer gas may be getting trapped in your home. When the ridge line of a home runs from east to west, the sewer vent can sometimes protrude from the roof on the north side of the home. When winds come from the south, they roll over the roof and down the north side of the roof. This can mean that the pressure from the air outside can actually force the gas back into your home! This is also an easy fix: Buy some high-density polyethylene pipe and place it over the vent pipe. Usually, this will make it long enough to avoid the draft and eliminate the odor in your home. If the odor is coming from just one sink in your home, it’s likely that that P-trap is clogged. This is the bend in the pipe under most sinks that tends to collect things like hair and toothpaste until it becomes clogged. You can either remove the P-trap to clean it out, or you can pour a cleaner down the drain each day until it’s cleared. Be sure to treat the drain on a regular basis to make sure nothing gets trapped again! Sometimes the foul smell coming from the sink isn’t from the drain. When the water itself is causing the smell, that usually indicates that the water heater has gone bad. Once you replace the anode rod, the scent should go away! If someone in your home (or a previous resident) is a smoker, then that smoke is in the air ducts, carpets, and even the walls. Unfortunately, the smoke smell can be extremely difficult to get rid of without professional assistance. Hiring a professional sanitation services company is the best way to ensure that you can get rid of the smell completely. If you have a front-load washing machine, you most likely close the door after washing a load of clothing. Unfortunately, since the doors are air-tight to prevent water from leaking, this can mean that the trapped water can begin to grow mold and mildew. In order to prevent this, make sure to leave the door open when the washing machine isn’t being used. Everyone who has had a pet has had to deal with a pet mess at some point or another. Even when the smell and stains fade away, the floors will begin to smell again as soon as the temperature in your home rises and the interior gets humid. Be sure to call the sanitation services professionals at SM Absolute to take care of these pet odors permanently. 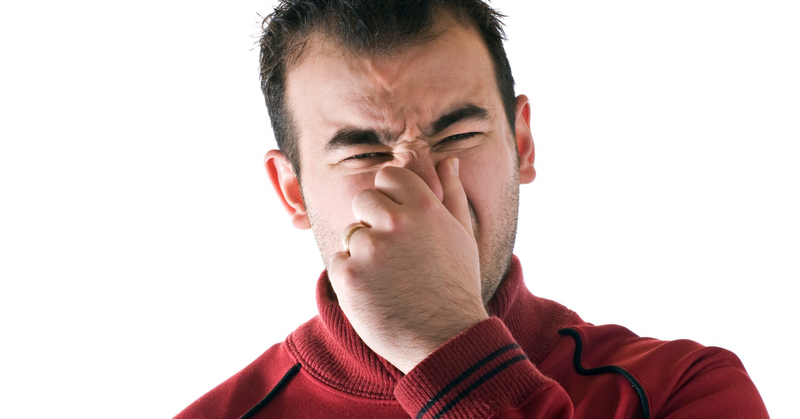 While you can take care of some odors on your own, others might demand a professional’s touch! Call San Diego’s sanitation services professionals at SM Absolute today!